Your warehousing and transportation service's provider who is easy to work with; we save you time and money; we guarantee results! Your same day and one day delivery provider for freight from one of our NJ warehouse or PA warehouse - or one of your own to most of the Northeast region. Your next day delivery provider from our Chicago warehouse to most of the Midwest region - or one of your own warehouses. Transport Systems helps you get your goods stored or delivered in difficult metropolitan areas, with a focus on warehouse services and transportation services in NJ, PA, Chicago and neighboring states. 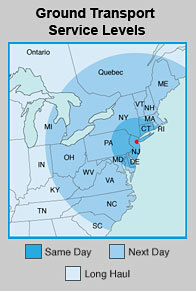 As your partner in the Northeast, you have access to a NJ warehouse and PA warehouse. As your partner in the Midwest you have access to our Chicago warehouse. In the Southwest you have a Phoenix location at your disposal. Manage the entire process on your behalf. Contact Transport Systems for more information about warehouse services and freight transportation we can provide for you.